Mr Randeep Singh Surjewala does not have to work hard to conceal his personal ambitions on becoming the youngest working president of any state unit of the Congress in the country. He sounds natural when he says that he is not a Chief Minister candidate. Late Chief Minister of Punjab Bhim Sen Sachar was a great freedom fighter who had left his profession of advocacy after the Jallianwala massacre in 1919 to join the freedom struggle against British rule. 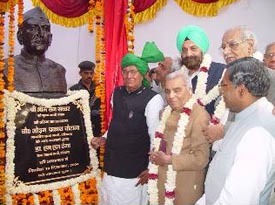 Haryana Chief Minister Om Prakash Chautala unveils the statue of former Punjab Chief Minister Bhim Sen Sachar in Panipat on Friday. Mr Trilochan Singh, MP, and noted journalist Kuldip Nayar are also seen in the picture. Despite the ban imposed by the Congress general secretary and in charge of the Haryana party affairs, Mr Janardan Diwedi, on holding separate rallies by different factions of the state Congress, the Bhupinder Singh Hooda and the Choudhary Birender Singh factions, every now and then, find ways to hold separate rallies to show their strength before the forthcoming Assembly elections. Chief Minister Om Prakash Chautala today laid the foundation stone of a project to develop residential sector under 'Niyojit Gram Yojana' at Khanpur village near Gohana. Panic gripped several villages as a large number of explosives seized from the fields Manana village of Samalkha today. The explosives, packed in twelve gunny bags, were lying in the fields of a farmer. The Special Judge of CBI cases in Haryana, Mr M.M. Sharma, adjourned the hearing on the anticipatory bail application of former Haryana minister Kartar Singh Bhadana to December 14 here today. A controversy has erupted over the alleged violation of the rules when some vehicles moved on to the platform at Ambala Cantt railway station to receive the General Manager (Railways). The Chief Election Commissioner of India, Mr T.S.Krishnamurthy, will visit Haryana on December 15 to review arrangements for the conduct of the state Assembly elections due early next year. He sounds equally humble when asked if his working under the Haryana Congress president, Mr Bhajan Lal, would annoy his Jat supporters. “To strengthen the party and to bring it back to power, I can work under even the juniormost member of the party. I am a worker and not a leader,” he says after taking up his new assignment here today without the usual fanfare associated with such occasions in any political party, what to talk of the Congress. Notwithstanding his assertion that he is not in race for the Chief Minister’s post, the fact remains that with his appointment as the working president of the Haryana Congress, the baton has been passed on to the generation next. Mr Surjewala says his first priority is to get the state rid of the “tyranny” of the Chautala Government, which, he says, is known only for corruption, criminalisation, centralisation of power and crass nepotism. It is clear that he would not like to rock the boat when he says that since the party is in the war mode, there is no need of any organisational changes. “If there are any gaps, more people can be given responsibility.” He sends a message to his supporters in the Youth Congress that soon opportunity would knock at their doors also. He agrees that the new assignment would give him additional strength and add to his stature in taking on the Chief Minister, Mr Om Prakash Chautala, in the electoral battle of Narwana. Mr Surjewala refuses to be provoked in criticising any of his senior colleagues, the feathers of many of whom his appointment must have ruffled. He maintains that the High Command must have consulted all senior Haryana Congress leaders, including Mr Bhajan Lal, Mr Bhupinder Singh Hooda and Mr Birender Singh, before appointing him as working president. He claims he has been sincerely assured of cooperation by all prominent leaders and others. He also sees nothing wrong with two prominent leaders holding separate functions to celebrate Mrs Sonia Gandhi’s birthday, which, he says, is not a violation of the directive issued by the AICC general secretary in charge of the Haryana, Mr Janardan Dwivedy, that all rallies are to be held under the banner of the Pradesh Congress Committee. Mr Surjewala says the calender of party activities will be decided after consultations with senior leaders and office-bearers of the party. The line of action on the panchayat elections will also be decided after a meeting of the office-bearers, but the Congress is prepared to face both Assembly and local body elections, he asserts. Late Chief Minister of Punjab Bhim Sen Sachar was a great freedom fighter who had left his profession of advocacy after the Jallianwala massacre in 1919 to join the freedom struggle against British rule. This was stated by Haryana Chief Minister Om Prakash Chautala while addressing a public gathering soon after unveiling the statue of Sachar on the premises of the Civil Hospital here and naming the hospital as Bhim Sen Sachar Hospital. Mr Chautala said that Sachar was practising as a lawyer in Gujranwala in 1919 but he was so affected with the atrocities of British rulers on his fellow countrymen that he left his profession and actively participated in the freedom struggle. The Chief Minister said that he was feeling proud to name the hospital after Bhim Sen Sachar and to unveil his statue on World Human Rights Day as he himself had worked a lot for the protection of human rights. The Chairman of the Minority Commission and Rajya Sabha member, Mr Tirloachan Singh, said that Mr Chautala had done a commendable work of naming the hospital after Bhim Sen Sachar. He said that no one except Mr Chautala had remembered him even after 26 years of his death. Renowned journalist Kuldip Nayar, son-in-law of Sachar, thanked Mr Chautala for installing the statue and naming the hospital as Sachar hospital. He said that he had tried a lot to get Sachar’s statute installed somewhere in Punjab but none of the politicians was ready to do so. When he talked to Mr Chautala about that, he instantly accepted his request, Nayar said. Former Chief Justice of the Punjab and Haryana High Court Rajinder Sachar, son of late Bhim Sen Sachar, talked in detail about the association of his father with the Chautala and Devi Lal family. Sachar’s several family members, Haryana Speaker Satbir Singh Kadian and Haryana Housing Board Chariman Krishan Pawar were also present on the occasion. Both the factions tried to attract as much public as they could in the name of celebrating Congress President Sonia Gandhi’s birthday. ‘Tyag Diwas’ (Sacrifice Day), commonly known as Hooda’s rally, and ‘Gaurav Diwas’ (Pride Day), known as Birender’s rally, were held at Gohana and Jind, respectively, on Thursday. Earlier also, the Birender faction had shown its strength by organising ‘Kamera Utsav’ at Gohana to celebrate the birth anniversary of Sir Chhotu Ram on November 24. On ‘Tyag Diwas’ rally, sources close to Mr Hooda said his faction did not want to take any risk in view of the two successful public gatherings, Birender’s Gohana rally on November 24 and the state Congress’ official rally in Sonepat on November 28. Mr Hooda himself telephoned most of the ticket-seekers of his faction in different parts of the state on December 5, after getting a nod from the Congress high command to organise ‘Tyag Diwas’, and asked them to bring at least 500 persons each along with them to participate in the rally. However, replying to a query regarding holding separate rallies in Haryana to celebrate Mrs Gandhi’s birthday, Mr Hooda said her birthday was being celebrated in every nook and corner of the country. It was good that several rallies and other functions were organised in Haryana too. The sector would spread over an area of 16 acres and have 132 residential plots, ranging from 10 marla to one kanal. The Chief Minister, who also visited a number of villages in Sonipat district, also laid the foundation stone of the Ramgarh distributary at the Shamdi road to be constructed at a cost of Rs 8.13 crore. The 17.37 km long distributary would provide irrigation facilities over an area of 9,267 acres. While speaking on the occasion, Mr Chautala alleged that the Congress had never given remunerative price to the farmers for their produce and even this year, the Central Government had made a meager increase in the price of sugarcane. Later in the day, he laid the foundation stone of an extension project of Guhna minor at Guhna village. It would cost Rs 1.33 crore for an extension of 7,224 feet. He also laid the foundation stone of a 33 KV sub-station at Butana village and inaugurated a 33 KV sub-station at village Khanpur. He also laid the foundation stone of a primary health centre to be constructed at a cost of Rs 45 lakh at Bidlana village and inaugurated a primary health centre at Rukhi village in Sonipat district. The sub-centre has been set up at a cost of Rs 37 lakh. The SHO of the Samalkha police station, Mr Rattan Singh, told The Tribune that the preliminary inspection showed the explosives were not live and they were only empty cartridges. At the same time, he said that the police did not want to take any risk and the bomb disposable squad was informed in this regard which would reach here by tomorrow morning. The police got an anonymous call today morning regarding the explosives. Following which, an ASI of Samalkha police station went to the fields and took the explosives found in the 12-gunny bags in his possession and brought them to the police station. Meanwhile, when contacted the Panipat SP, Dr Suman Manjri, said the explosives might be fog bombs used by the Railway Department during winter. Such type of bombs had been found from a canal in the model town of Panipat some time back, she said adding, everything would be clear after their inspection by the squad. The CBI had filed a charge sheet against Mr Bhadana and four others under Section 379, IPC, Section 21 of the Mines and Mineral (Development and Regulation) Act, 1957, and Sections 13(1) (d) and 13(2) of the Prevention of Corruption Act, 1988, last month on the allegation of illegal mining in Faridabad. Mr Bhadana had filed an anticipatory bail application in this court on December 3. The CBI filed an application in the court today in which it stated that its senior public prosecutor was busy in a Chandigarh court. The CBI requested the court to adjourn the hearing as arguments on the bail application could not be possible in the absence of its counsel. Counsel of Mr Bhadana, Mr Ajay Jain, did not object. While, some railway personnel claimed that there was a violation of the rules, a senior railway officer said the norms as laid down for VIPs had been followed. The officer stressed that the rules had not been violated. The incident had taken place on December 2 when the GM Railways, Mr RR Jaruhar, had come for an inspection. The vehicles had gone to pick him up from the railway platform. This incident was being claimed to be a violation of rules. However, a railway officer explained that the GM saloon had arrived at the saloon siding. "The platform was 1A which is a siding line. So, the norm was followed for receiving the General Manager (Railways). An unneccesary attempt is being made to create a controversy," he added. The Chief Election Commissioner will meet representatives of the recognised national and state political parties in Chandigarh on December 15. He will also meet the Chief Secretary, the Home Secretary, Divisional Commissioners and range Inspector-Generals of Police.